Peoples’ Self-Help Housing collected thousands of holiday gifts donated by the community during its Stuff the Bus Toy Drive to benefit kids at its South Coast properties. The toy drive culminated in the Stuff the Bus Parade down State Street Wednesday to pick up the final load of toys. Santa Claus, Mrs. Claus and local elected officials and business leaders cruised State Street in a decorated MTD shuttle for the Stuff the Bus Parade Wednesday, making stops along the way at business fronts to pick up boxes of gifts community members have been donating over the last few weeks. The toys, which were loaded onto a separate MTD bus, will go to children 0-11 living at PSHH’s affordable housing properties from Carpinteria to Goleta. PSHH also received gift cards for clothing, shoes and books for resident pre-teens and teens, ages 12 to 17. “It was amazing to see hundreds of toys get packed into the bus,” said John Fowler, President and CEO of Peoples’ Self-Help Housing. The Stuff the Bus Parade began at 10 a.m. at Community West Bank, located at State and Micheltorena Streets, where Mr. and Mrs. Claus were available for photos before boarding the bus with elected officials, including State Senator Hannah-Beth Jackson, State Assemblyman Das Williams, Santa Barbara County First District Supervisor Salud Carbajal, and Santa Barbara City Councilwoman Cathy Murillo. 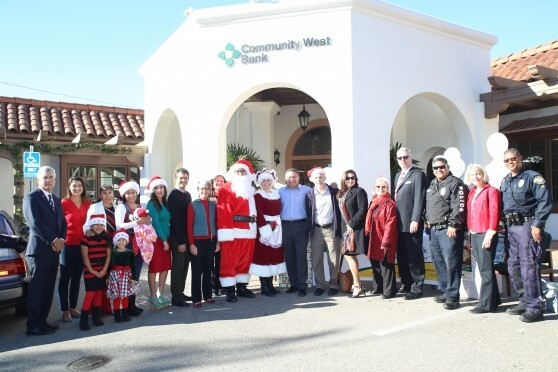 Escorted by Santa Barbara Police Department officers, the parade made stops at Starbucks, 1235 State St.; Montecito Bank & Trust, 1000 State St.; Marshalls, 900 State St.; and Hotel Santa Barbara, 533 State St., to pick up donated gifts. The parade then traveled to PSHH’s Ladera Apartments, 322 Ladera St., where volunteers were waiting to sort and wrap the load of gifts. For more information, call 699-7220. To donate by smartphone, text “BUS” to 51400. Toys and gifts cards can still be drop off at PSHH office, 26 E. Victoria St., Santa Barbara Monday-Friday 9 a.m. to 5 p.m. Founded in 1970, PSHH is an award winning non-profit organization that develops affordable housing and community facilities for low-income households and homeownership opportunities for working families and special needs populations, such as seniors, veterans, the disabled, and the formerly homeless. With nearly 1,200 self-help homes completed and over 1,600 rental units developed, PSHH is the largest affordable housing developer on the Central Coast, with offices in Santa Barbara and San Luis Obispo. For more information on Peoples’ Self-Help Housing, visit www.pshhc.org,emailcommunications@pshhc.org or phone (805) 699-7220. — Angel Pacheco is a publicist representing Peoples' Self Help Housing.